"Making Molasses: An Age-Old Art"
When the wintry winds blow and the snow falls in the month of February, what could be more appealing than a big plate of steaming hot pancakes for breakfast, lathered with butter and covered with molasses? Not the usual kind of molasses you find n a store, mind you, but the rich, dark, homemade kind -- that kind made by the Waymon Totten family of Yanceyville. The growing of sugar cane for the making of molasses has been known for centuries, and the Totten family uses that knowledge to the fullest. Every few years, the whole family -- Waymon and Beatrice, and sons Tommy, Henry, Otis, Robert, Waymon and J. C. -- gather together for the pleasant ritual of boiling down cane sap to make the molasses. The process is a simple one, but one that takes considerable time from start to finish. Beginning in mid-fall with a cane field grown on the family's farm, it takes at least seven or eight hours for the process to be completed. The first step is to cut the cane and strip it of its dry outer covering, which later will be used for livestock feed. A tractor is then connected to an ancient cane press, into which the cane stalks are slowly fed. The press crushes the sap from the cane, and it runs, green and foaming, into a large tub placed at the bottom of the press. Up to fifty gallons of the sap is collected before it is poured through a burlap bag strainer into a large boiling tub, roughly three feet by seven feet, and two feet deep. Underneath the boiling tub is a pit, in which a fire is built and fed with hickory or oak slabs. The fire must be watched constantly during the boiling process, lest the molasses be damaged by a fire too hot or too cool. The sap is cooked in the boiling tub for five hours or so, the cook watching carefully as the green, thin sap turns slowly into thick brown molasses. The sap must be stirred constantly during the cook process to avoid scalding, and the cook and his helpers stand close by with long ladles skimming the green foam from the top of the sap as it forms. To leave the foam on the sap would cause the molasses to be bitter instead of sweet. After the sap has been cooked for the required length of time, it has developed just the right consistency and color for true homemade molasses. It is then poured quickly into glass containers and left to stand, a thick, dark green foam rising to the tops of the containers. Unlike the foam that was skimmed from the top of the molasses while cooking, this foam is sweet as sugar itself, and is later drawn off to provide the base ingredient for "molasses pudding," which is served as a dessert. The finished molasses has a long shelf life, and jars of the homemade sweetener have been known to sit on a shelf for ten years or more, only to have the same fresh taste when opened as the day it was bottled. In a good growing year, a cane crop such as grown on the Totten farm could provide up to 100 gallons of molasses, which is then divided up among the members of the family. Some of each batch is sold to non-family members, but the Totten family doesn't make a business of supplying the old-fashioned concoction for profit. To watch the making of molasses in this traditional way is to be temporarily transported into another time, a time when everyone joined together at harvest time to work together in providing food for their families for the coming year. One would notice, too, that the cooking of molasses provides more than just an edible product. It provides a chance for socializing, for sharing the days news, and spinning tall tales. Yes, while such social events as taffy pulls, barn-raisings and quilting bees have largely disappeared from the scene, one such event is kept alive by the Totten family of Yanceyville, who, as makers of homemade molasses, have kept an age-old art and made it a part of their lives. Source: "Making Molasses: An Age-Old Art." The County Magazine, February 1983, Pages 8-9. Print. 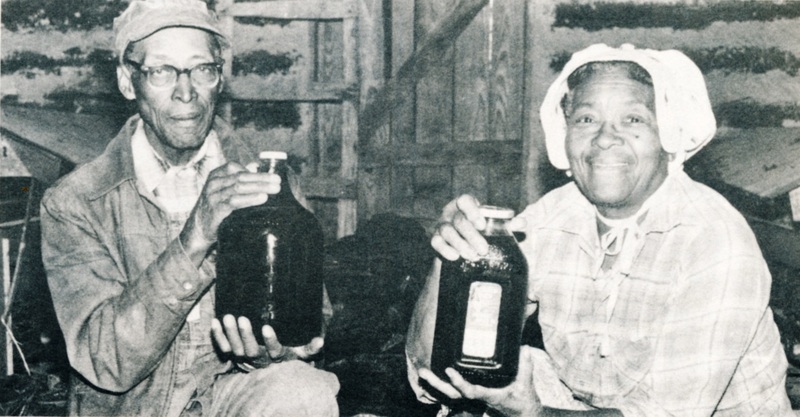 Photograph: James Waymon Totten (1910-2002) and wife Beatrice Williamson Totten (1914-2001) displaying jugs of molasses made in 1983 on their Caswell County farm.